Frank McCulloch, a giant in California journalism, played an important role in the founding of FAC in 1988. McCulloch was a key editor who helped transition a small Freedom of Information committee, sponsored by the California Newspaper Publishers Association, into an independent organization of journalists, attorneys and FOI/First Amendment experts who would be serving the general public and not just newspapers. McCulloch attended the organization meeting and was a strong champion of FAC and its mission throughout his life. By Warren Lerude — Frank McCulloch, the son of a pioneer Nevada ranch family who served as a combat war correspondent and led major American news organizations, distinguishing himself as an icon for a free press, died on May 14, 2018. He was 98. His family was close by at a Santa Rosa, CA, nursing facility where he had been treated for a brief illness. McCulloch served as a reporter, editor and bureau chief for Time-Life News Service bureaus ranging from New York and Washington, D.C., to Dallas and Los Angeles. He served as Southeast Asia bureau chief in Hong Kong and Saigon covering the Vietnam war and in top editor positions at the Los Angeles Times, the national McClatchy newspaper company based at the Sacramento Bee and the San Francisco Examiner. “I speak for a great many others in different venues where Frank worked, and was admired, and always made a difference. Some of us had a sense of his iconic status for a long time, going back as far as l967” when McCulloch covered the Vietnam war as “a marvelous reporter”. President Johnson was enraged by McCulloch’s Vietnam reporting in l966 that he planned to build up American forces to 545,000. Halberstam recalled a senior reporter in Washington raised the topic with Johnson, “who famously answered that Time’s bald-headed Saigon bureau chief had been wandering around in the sun without a hat and was addled. Well, they loved that in the upper levels of the Time hierarchy. The fact that the president knew that Time’s man was bald.” McCulloch’s own colleagues in the Time-Life Washington bureau were critical but by 1968 the forces had grown to that number. A meeting with Indonesia’s President Sukarno. 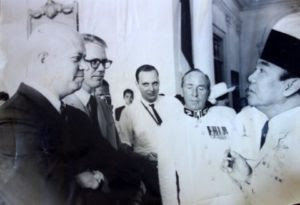 One disagreeable source, Indonesian ruler Sukarno, confronted McCulloch because of his reporting in Time. McCulloch recalled their intense, face to face standoff. “He was threatening to throw me out of the country, and I told him I didn’t think that would be a very good idea for either of us.” Sukarno backed down. McCulloch was credited at the San Francisco program for inspiring a generation of reporters, including Halberstam, Karsten Prager of Time Magazine, Lowell Bergman of The New York Times and PBS Frontline and scores of others. Young reporters saw McCulloch as a visionary. He predicted the death of once robust Life, Look and the Saturday Evening Post national magazines, which he prophesied being forced to give way to television’s dramatically moving photo journalism, increased depth reporting in major newspapers and a proliferation of specialized topical magazines. He encouraged one young Associated Press reporter to join his staff as a business writer at the Los Angeles Times in 1962 with a promise of spirited competition to beat back the invasion of The New York Times in a newly planned West Coast edition. He confided to the reporter ahead of any official announcement of the creation of The Washington Post/Los Angeles Times news service to compete with the well established new service of The New York Times. McCulloch wrote many Time Magazine cover stories, including a l955 piece on Justice Thurgood Marshall of the U.S. Supreme Court, when the cover stories had a unique status in national journalism. He covered a range of presidents from Truman to Johnson, Nixon and Ford as well as Generals Curtis LeMay and William C. Westmoreland and writers John Steinbeck and Ernest Hemingway. McCulloch was the last reporter to interview billionaire Howard Hughes when, in l958, the Hollywood and aviation celebrity took him on a flight over Southern California and Arizona in a prototype of the 707 to predict a new era of jet plane passenger traffic. McCulloch made news himself in l972 when author Clifford Irving claimed to have interviewed the by-then reclusive Hughes for a book and Life Magazine serialized the story as authentic. Hughes called McCulloch, then working in Time-Life New York headquarters, to reveal it as a hoax, and McCulloch stopped the Life presses in Chicago to kill the magazine’s serialization, upsetting his bosses at Time-Life. The dramatic turn of events eventually was made into a movie, The Hoax, starring actor Richard Gere. Another actor played the bald-headed McCulloch character. McCulloch was born in Fernley, Nev., about thirty miles east of Reno, on Jan. 26, 1920 to ranchers Frank and Freida McCulloch and educated in rural classrooms and at Reno High School. He worked at his school paper but really broke into journalism as the editor in charge of the University of Nevada student newspaper Sagebrush in Reno, graduating with Phi Beta Kappa honors in 1941. Frank McCulloch with wife Jakie in the 1940s. The university presented him an honorary doctorate when he returned to the campus as commencement speaker in 1967 and named him a Distinguished Nevadan in 2018. He was further honored by his alma mater when the Reynolds School of Journalism created the endowed Frank McCulloch Courage in Journalism Award, given annually to journalists of national achievement, and the student newspaper designated the Frank McCulloch Lifetime Achievement Award for distinguished alumni. He was selected twice as the Distinguished Scripps Lecturer that honored fellow Nevada journalism graduate Ted Scripps of the Scripps Howard news organization. After graduation, McCulloch worked for United Press in San Francisco as a reporter, then served in the U.S. Marine Corps from 1942 to 1945. He served as a reporter covering crime, sports and politics for the Reno Evening Gazette from 1946 to 1953, then joined Time-Life News Service where he began his long news magazine career. He was a founder of Learning Magazine in 1972. One highly controversial libel suit involved U.S. Sen. Paul Laxalt, R-Nevada, and investigative reports in The Sacramento Bee about finances at the Laxalt-owned Ormsby House hotel in Carson City, Nevada’s capital. The story gained national prominence because of Laxalt’s status as close friend to President Reagan and the possibility of Laxalt himself becoming a presidential candidate. Laxalt challenged the story as defamatory and libelous. McCulloch stood behind it, declaring at a 1983 journalism forum in Reno: “It certainly would not have been published had we not been utterly confident that everything was factual and, in a broader sense, true.” The suit was settled amid a bristling controversy between Laxalt and the McClatchy organization with details not made public. At the height of the intense libel drama, coffee cups appeared in the Sacramento Bee newsroom proclaiming in bright red ink: “Laxalt Our New Editor Publisher.” McCulloch ironically recalled to a friend how he played basketball for Reno High School against Laxalt at Carson City’s high school. The Center for Investigative Reporting, at its San Francisco program honoring McCulloch, cited “his passion for investigative reporting” by noting he “was named in seven libel suits — all unsuccessful — during his McClatchy years that helped establish protections from which journalists still benefit today”. The Examiner published a special edition celebrating — and lamenting — McCulloch’s retirement while noting he would still be on hand in a consulting role. The boldface headline “GURU GONE” carried a second line of type: “Frank-ly, We Give a Damn.” Still another headline proclaimed McCulloch retires, sort of, after journey from Fernley to Sonoma, noting he and his wife of 49 years, Jakie, would make San Francisco’s wine country suburb their retirement home where their two daughters lived with their families. He remained a strong voice for the First Amendment against political censorship. In 2014, at age 94, blind in one eye and nearly so in the other, he helped lead a group of journalists across the nation to convince the Pulitzer Prize Board at Columbia University to correct a controversial wrong in the history of American journalism. McCulloch wrote the group’s lead letter petitioning for a posthumous Pulitzer Prize for Ed Kennedy, who broke the news of the German surrender May 7, 1945, to the Allied Forces. Kennedy was fired by the news service amid claims that he broke an embargo delaying the announcement for political purposes. The AP apologized for the firing 67 years later, acknowledging its error and praising the long-disgraced war correspondent’s work in reporting the historic news. McCulloch wrote to the Pulitzer Board: “There are two kinds of censorship: Military censorship, to save lives, and political censorship, by means of which one of the combatants tries to bend the press to its will on matters having nothing to do with saving lives. To personalize this, I became intimately familiar with both kinds when I was a combat correspondent during the Vietnam war, when political and policy censorship was largely a failure. McCulloch and the committee of journalists urged the Pulitzer Board to award Kennedy the high honor. It declined to do so without explanation. 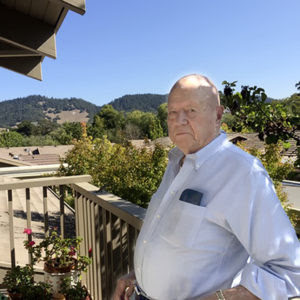 In retirement, McCulloch confided to friends that he still dreamed of being back in the newsroom, and he didn’t stray too far from it, continuing to consult with newspapers, talk with journalism students and lend his expertise to the nationally prominent Center for Investigative Reporting in the Bay Area. McCulloch is survived by daughters Michaele Lee (Dee Dee) Parman and Candace Sue (Candy) Akers of Santa Rosa, CA. He was preceded in death by wife Jakie Caldwell McCulloch, son David Caldwell McCulloch and sons in law Mike Parman and Ron Akers. He is also survived by grandchildren Christopher T. Parman and Leah M. Parman, step grandchildren Elizabeth A. Akers and Erica L. Akers, great grandchildren Sienna P. Clark, Alden L. Clark, Cole A. Parman, Jake R. Parman and Zachariah L. Akers. A memorial service was to be planned. In lieu of flowers, donations may be sent to the Frank McCulloch Courage in Journalism Award Program at the Reynolds School of Journalism, University of Nevada, Reno Nevada, UNR Foundation, MS0162, Reno, NV. 89557. This article is reprinted by permission of the author Warren Larude, a Pulizer Prize winning journalist who served on the l982 Washington, D.C. launch team for USA TODAY, and long-time journalism educator. He is a long-time journalism educator and serves on the Maynard Institute for Journalism Education board. He created the Warren Lerude Writing Center and Lerude First Amendment Endowment. Warren served as Nevada Press Association president.